Polytec MELAMINE Doors are manufactured on 16mm thick double sided moisture resistant MDF.Boards are made from plantation wood fibres,which are bonded together with resin (glue). The product is surfaced on both sides with a decorative paper impregnated with resin. 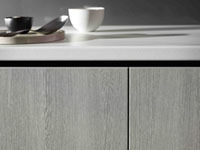 Door edges may be post formed and/or may be finished with 0.4mm – 2mm edging. A plethora of choices available. Inspired by top design houses, polytec's ULTRAGLAZE mirror gloss doors & panels offer interior designers and architects a new dimension in creating kitchens and rooms of breathtaking beauty. The lustrous mirror-like ultra high gloss finish captures the light and surrounding reflections. Alsert Doors offer the perfect finishing touch to your project with a huge range of premium quality aluminium doors available. This versatile range of aluminium frames and door inserts is the largest offering available in Australia, with 12 profiles and 5 different finishes on offer. Made from high grade European aluminium, Alsert frames are designed, engineered and extruded in Germany and come with a 10 year warranty on all aluminium products and assembly. Alsert Doors represent the ultimate in design and style and can be used on kitchen cabinet doors, pantry doors, sliding doors, bi-fold doors, drawer fronts and more. Laminex Doors With over 170 contemporary décors tochoose from, including solid colours, woodgrains and patterns, achieving your vision for inspirational interiors is surprisingly easy. With 7 year limited warrantysee brochure. Thermolaminated doors and panels are made from profile moisture resistent E-Zero MDF, constructed with a durable and decorativesurface on the face and edge.The result is stylish fully profiled door. Its thermolaminated surface makes it resistant to the usual knocks and bumnps of a busy household.They are available in a range of solid colours and timber prints.